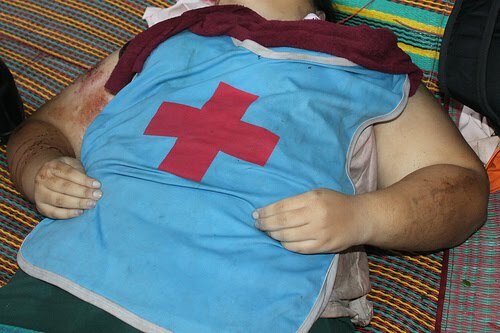 A paramedic's account of the night of May 19 points toward activity by armed personnel as depraved as anything that happened in Burma in September 2007. A female paramedic named Kade who was standing attending to the wounds of an injured person inside the medical tent inside the temple was shot dead on the spot. While bullets flew around, Keng told everyone to run to hide inside the temple’s pavilion. The firing took about a few hours. Those who tried to get to the fallen bodies were shot. Keng was busy helping the injured, tending wounds and stopping bleeding... One small person suffered in pain until he died at about midnight.... He was hit while he was helping the paramedics. The small guy was a red shirt from Kalasin. He had always come to help Keng and the other paramedics. ... All paramedics wore red cross signs, but that did not save them from being shot. Bullets were fired right at the medical tent, Keng said. The bullets came from a high angle. Despite a large sign put up that read ‘Sanctuary’ and everyone’s belief that inside the temple was the safest place, bullets came from the darkness. Keng said it was likely that the gunshots were fired from the BTS skytrain track up above. On the morning of 20 May, at about 7-8 am, before police and the press came, when some of those inside the temple came out to look for food to share with the others, gunshots were fired from above. Soldiers were seen on the BTS track, carrying rifles. Among the six dead inside the temple, three wore red cross signs. The above photo shows two snipers on skytrain tracks overlooking a temple. If you click on the photo you will be able to see the snipers. 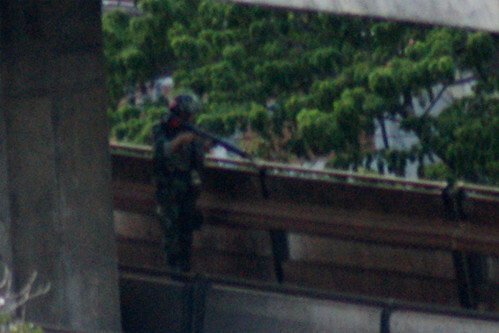 They come to us via mediawar, who tweeted, "apparently these photos confirm Keng's words (about snipers on BTS)." The other photo is here. I don't know who took the photos [see update]. "He said the gunmen were behind the concrete slabs on the second level of the elevated skytrain tracks. Everyone ran further inside the temple after the first man and the nurse were shot. 'From that position, the gunmen had a clear view of the temple,' he said." "We don't know who shot at us," said a foundation official. "But in my opinion, the shots must have been fired from a high position. "Our temple is ringed by a high wall and the police headquarters are located just opposite us," he added. "So they must have been where they could not be seen by the police or passers-by." Among the eyewitness accounts from May 19 compiled at Therelive.com are a number of reports from journalists who had been present at Wat Pathum temple. Mark MacKinnon, In a Bangkok Temple, the groans of the wounded shot seeking sanctuary - "... a place of death and terror as perhaps 1,500 civilians huddled inside." Regarding the incident, at least two reports have appeared in the Thai media. Andrew Buncombe, upon reading the Nation's account of his reporting, tweeted, "Interview with me in Nation is headlined: "Gunefire made temple a scary place, reporter says" is true, but that is not the story." Wat Pathum Wanaram is located between two shopping malls Siam Paragon and CentralWorld, and across the street from Siam Square. Many red shirts had sought refuge on the temple grounds after the surrender of their leaders to Thai authorities. MediaWar has just written me to say, "looks like I've found source." The caption to a Getty photo at Daily Life reads: "Soldiers take position after gunshots were heard near a Buddhist temple in the heart of an anti-government protest zone, in downtown Bangkok on May 20, 2010.... soldiers were advancing on foot along an elevated train track, an AFP photographer saw." The caption to another photo reads, "A Thai soldier keeps guard in front of a temple which had been turned into a shelter within an anti-government protest site in downtown Bangkok on May 20, 2010. Thai police escorted thousands of protesters out of a Buddhist temple where they had cowered overnight after nine people were killed there in gunbattles." More Getty images of the temple here. Al Jazeera reports on the death of a young Thai medical worker at the temple. Thailand Crisis 2010 blogger has posted the latest Prachatai photos and translated the captions. Prachatai English has posted a sad account entitled Kade, a life lost at Wat Pathum: "Kamolkade Akkahad was 25 when she was shot dead inside Pathumwanaram Temple on 19 May .... She was hit while wearing a paramedic’s uniform. Doctors said she was hit twice, and her brain was damaged by the bullets. Her friends who received her body suspected that she had been hit more than twice." Reports suggest that Ms Akahad was killed sometime after 7pm while attending to a man with gunshot wounds who had been hit outside the temple and then carried inside and laid down at a makeshift first-aid area, located near a souvenir shop. The injured man, Kittichai, survived his injuries, thanks to the intervention of the medics and his eventual evacuation to hospital by ambulance. Among the people at the temple yesterday was a man who was also present last week and who said he had watched Ms Akahad and other volunteers attend the wounded. The man, who gave his name as Tom, claimed he had seen two soldiers located on the route of the passing light railway fire into the temple grounds. He took out his mobile phone to reveal photographs of injured people being treated inside the temple grounds. Tom, a temple workman, said he had also been at the front of the compound when Ms Akahad was hit. He said he had seen her helping the injured man, then stand up to collect more first aid supplies. It was at that point that the young woman whose first instinct was to help others was shot. "She was near the first-aid tent," he said, "doing first-aid. She was saving a man's life." How is it possible that professional soldiers would shoot medical workers? How is it possible that the ten week long Bangkok protests resulted in the deaths of two journalists and serious gunshot injuries to at least six others members of the press? You might want to read the short article for yourself. Personally, I think it's one of the strangest, most disturbing news stories I have ever read. I think it may shed light on the killings at Pathum Wanaram -- and many other senseless shootings that have occurred. Following a deadly close encounter with Thai soldiers on May 15 Australian photojournalist Nick Nostitz observed, "So far, the military has not given me much reason to feel safe, especially their use of snipers on many of the high rises and bridges." In an article published in der Spiegel, Thilo Thielke described circumstances surrounding the shooting death of his friend and colleague, Italian photographer Fabio Polenghi on May 19: "Since the beginning of the conflict," Thielke writes, "I have experienced the Thai army as an amateurish force." Bangkok Pundit has a new post on events at Wat Pathum that presents analysis and yet more eyewitness testimony. The temple shooting demands answers, but photo in the lower right of http://sphotos.ak.fbcdn.net/hphotos-ak-snc3/hs617.snc3/32457_126427180716394_100000473393770_268120_2283871_n.jpg is above Sala Daeng intersection, nowhere near the temple. That one didn't seem to fit with the others. Thanks for pointing out its actual location. This is Siam Intersction, not Sala Daeng. You can see the plants infront the temple. At Sala Daeng, you will only see buildings. The latest news is that Keng has received a summon warrant from CRES. Everyone knows what that means.